Renishaw is showcasing its range of 3D printing technologies at Formnext. 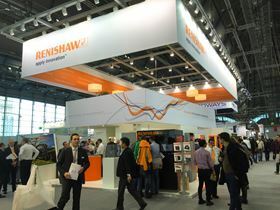 Additive manufacturing (AM) technology company, Renishaw is showcasing its range of 3D printing technologies at Formnext, taking place from 14–17 November in Frankfurt, Germany. The company plans to introduce its new RenAM 500Q four-laser additive manufacturing (AM) system, which can reportedly reduce cost per part whilst maintaining the quality and precision offered by standard single laser systems, by speeding up the process by up to four times. Renishaw says the RenAM 500Q could increase the market of metal AM into applications that are presently uneconomic. The company will also be exhibiting its AM process monitoring technologies that allow manufacturers to benefit from gathering and analysing sensor data from additive manufacturing systems to develop consistent processing. New products on show include InfiniAM Central and InfiniAM Spectral which give users information to understand the component build process and monitoring melt pool characteristics in high resolution. ‘Multiple laser technology in a small footprint will broaden the appeal of additive manufacturing in new markets and applications,’ said Robin Weston, marketing manager at Renishaw's additive manufacturing products division. ‘The technology is moving towards applications where it's not just the technical benefits of AM that are attractive but also the production economics of using it in a serialised manufacturing process for high quality components. At Formnext, Renishaw will also present High Temperature Build Volume, a new technology that enables manufacturers to build components from materials that are not currently feasible.